Early ticket sale starts Wednesday, Aug. 29. Fans can begin purchasing tickets online Wednesday, Aug. 29 at noon at rooftopcinemaclub.com/houston. The full October lineup below features carefully curated films intended for Houstonians to celebrate cinema in a new and more social way. 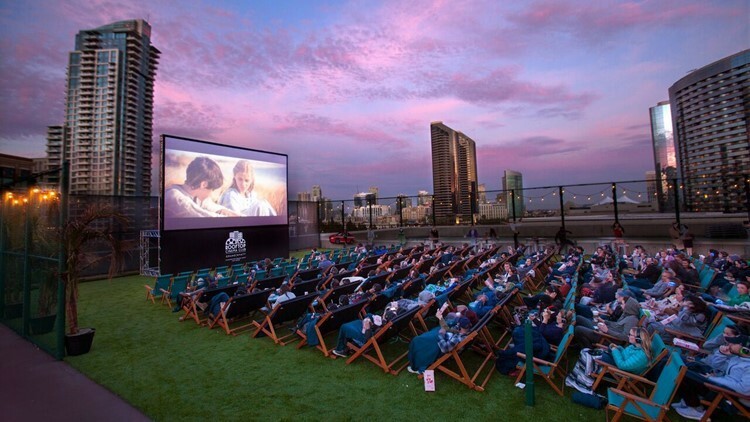 Following opening weekend, the rooftop spends a week paying tribute to popular Texas films followed by weeks of “Rooftop Classics” like “Top Gun,” “Selena,” “Black Panther,” and more. Sprinkled throughout the month are anniversary celebrations of beloved films such as “Tombstone,” “The Sandlot,” and “Dazed and Confused,” each celebrating their 25th anniversary. Fans of “2001: A Space Odyssey” can celebrate the film’s 50th anniversary on Oct. 27 or the 40th anniversary of “Halloween” on well, Halloween night, Oct. 31. Thurs., Oct. 4 "Coming to America"
Fri., Oct. 5 "Back to the Future"
Sat., Oct. 6 "The Greatest Showman"
Thurs., Oct. 11 "Reality Bites"
Fri., Oct. 12 "Dazed and Confused"
Tues., Oct. 16 "Black Panther"
Wed., Oct. 17 "Steel Magnolias"
Thurs., Oct. 18 "The Best Little Whorehouse in Texas"
Fri., Oct. 19 "The Birdcage"
Sat., Oct. 20 "Top Gun"
Wed., Oct. 24 "The Sandlot"
Thurs., Oct. 25 "The Goonies"
Fri., Oct. 26 "Galaxy Quest"
Sat., Oct. 27 "2001: A Space Odyssey"
Tues., Oct. 30 "The Texas Chain Saw Massacre"
Tickets for opening weekend go on sale Wed., Aug. 29 and start at $17 per person for a single deck-chair or $20 for a deck-chair and bottomless popcorn. Couples can also choose a double love-seat and popcorn for $24 per person. All tickets include studio-quality wireless headphones and cozy blankets for use during the movie. Show times and tickets can be purchased at rooftopcinemaclub.com/houston.